GoXtra News: Swazi Dlamini unveils new album ‘Soul of Me’ at Lion of Africa music concert! Swazi Dlamini unveils new album ‘Soul of Me’ at Lion of Africa music concert! 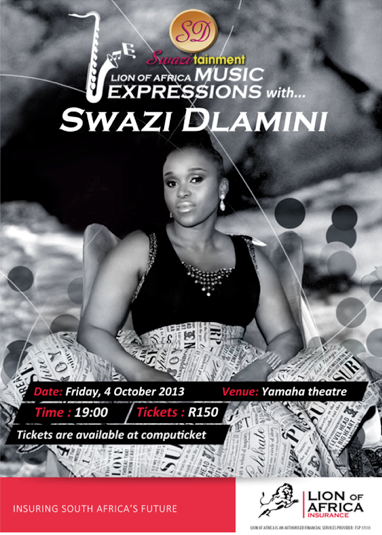 Multi-award winning singer, songwriter and producer, Swazi Dlamini, has announced the release of her new album, Soul of Me, during the sixth installment of the Lion of Africa Music Expressions series, taking place on Friday, 4 October 2013, at one of South Africa’s most popular theatres, Yamaha Theatre at YAMAHA Woodmead. Swazi is no stranger to the music industry, having started her music career as a vocalist for the award-winning gospel group, Joyous Celebration. She rose to stardom with the release of her debut album, My First Love, which earned her the Sama 2004 Best Female artist, and Kora 2004 most promising African Female artist awards, respectively. Swazi is not only a sensational vocalist, but also an aspiring business woman with Swazitainment Productions - her co-owned company with husband and fellow musician, Tshepo Mngoma. Soul of Me is a 13 track album that caters to both casual and experienced jazz fans. Music fans can look forward to being dazzled by blissful sounds from a transformed Swazi during the sixth installment of the Lion of Africa Music Expressions concert. Sponsored by Lion of Africa Insurance, in association with Swazitainment Productions, the Lion of Africa Music Expressions series aims to showcase and develop South Africa’s best upcoming, as well as existing musical talent. The music concerts take place once a month on Friday evenings over a period of nine months and will be staged at various theatres in Gauteng and Tshwane, with plans to reach other provinces in the pipeline. Tickets are available at Computicket and at the door. 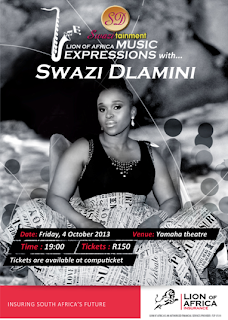 Date: Friday, 04 October 2013.